Silver amalgam fillings date back to the mid-1800s. Around that time, dentists realized that mercury and silver could be combined into a paste that hardened into a material that could be used to fill a tooth after the decay was removed. The technical term for this type of filling is amalgam, yet it is more commonly referred to as a silver filling. If you are an adult, there is a good chance you have a silver amalgam filling in your mouth. But what you may not realize is that these fillings actually contain more mercury in them than silver. In fact, approximately 50% of the content of amalgam is mercury. It is common knowledge that mercury is a toxic substance. So it is understandable that many people are concerned about the potential negative health effects of having mercury placed in their mouth. Although the topic is controversial, the American Dental Association still feels amalgam fillings are safe. As technology and techniques advanced in dentistry, a mercury-free option was developed. White composite has proven to be a durable alternative to amalgam fillings, even on back teeth. Concurrent to this discovery, bonding technology has also progressed to enable composite to be permanently bonded to the tooth. In order to successfully place composite fillings, the tooth must be completely isolated, which requires much advanced training in bonding techniques. In some cases, dentists think it is easier to stay with the “tried and true” amalgam fillings. But Dr. Coleman has embraced this newer technology and has mastered the techniques required to successfully place composite fillings. His practice is completely mercury-free. White fillings are bonded to the tooth, which actually increases the strength of the tooth. Patients report less post-operative sensitivity with composite fillings. More of the natural tooth structure must be removed with amalgam fillings, whereas composites bond to this weak tooth structure and strengthen it. The composite material forms a seal which helps to protect the tooth from future decay. Over time amalgam fillings can corrode. Composite fillings look much nicer, too. The material is the same color of the tooth so it blends in for a natural look. You can see a side-by-side comparison below of amalgam fillings compared to tooth-colored composite fillings. 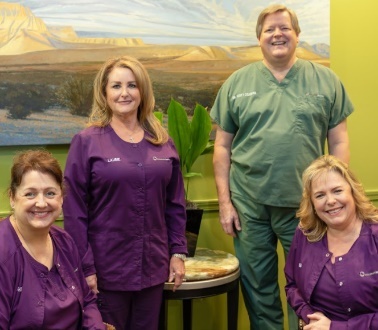 Dr. Coleman hasn’t placed an amalgam filling in decades. If you are interested in mercury-free fillings, please contact us at 713-783-2800.